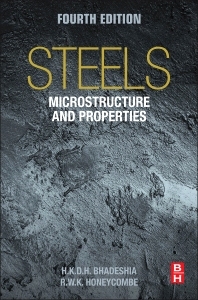 Steels: Structure and Properties, Fourth Edition is an essential text and reference, providing indispensable foundational content for researchers, metallurgists, and engineers in industry and academia. The book provides inspiring content for undergraduates, yet has a depth that makes it useful to researchers. Steels represent the most used metallic material, possessing a wide range of structures and properties. By examining the properties of steels in conjunction with structure, this book provides a valuable description of the development and behavior of these materials—the very foundation of their widespread use. The new edition has been thoroughly updated, with expanded content and improved organization, yet it retains its clear writing style, extensive bibliographies, and real-life examples. 14.2. Why the yearning for exceedingly fine grains? Harry Bhadeshia is the Tata Steel Professor of Physical Metallurgy at the University of Cambridge, UK. His research is concerned with the theory of solid-state transformations in metals, particularly multicomponent steels, with the goal of creating novel alloys and processes with the minimum use of resources. He is the author or co-author of more than 600 research papers and six books on the subject. He is a Fellow of the Royal Society, Fellow of the Royal Academy of Engineering, the National Academy of Engineering (India) and the American Welding Society. In 2015 Professor Bhadeshia was appointed a Knight Bachelor in the Queen's 2015 Birthday Honours for services to Science and Technology.